Our foundation is built on a solid knowledge of what makes great design, and the ability to translate that knowledge to a usable, productive, end-user experience. Below is a list of some of our recent and past projects. 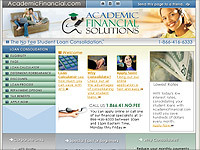 www.AcademicFinancial.com - Academic Financial Solutions, LLC was established to help consumers take charge of their finances by consolidating existing Federal student loans. 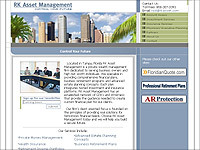 www.RKasset.com - Located in Tampa, Florida RK Asset Management is a private wealth management firm dedicated to serving business owners and high net-worth individuals. 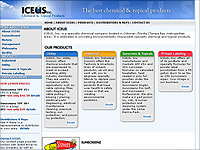 www.Iceus.com - ICEUS, Inc. is a specialty chemical company located in Oldsmar, Florida. It is dedicated to providing environmentally responsible specialty chemical and topical products. Iceus.com helps provide important material documents (.Doc & .PDF) to customers. A secure online order form has helped reduce call volume and speed up order processing. 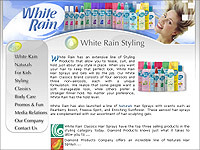 www.WhiteRain.com - White Rain hair products. The company wanted a new look to update their old site, and wanted to promote a new product. www.TeTao.us - Diamond Products Company is a distributor for Te Tao, a UK company. For the US Te Tao line, they wanted a clean fresh design to promote the products herbal, natural qualities. www.Dippity-do.com - Dippity-do hair products became popular in the '60s, but their image has faded over time. Diamond Products began a new advertising campaign geared to the "X" generation, and X Gamers. The new design is bold, colorful, and active. This site was featured and promoted along with ESPN Summer X Games. www.eAngler.com - Site Redesign. The site design is over a year old, but looks clean, fresh, and new. Heavy use of CSS, ASP and SQL. www.PaulaVarsalona.com - Top bridal designer, Paula Varsalona, wanted a redesign to launch her 2003 collections. Also, Apexity has been chosen again to launch her 2004 collections. 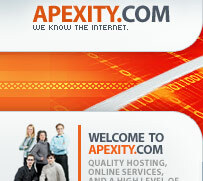 www.Apexity.com - Our own business website serves as an example of our work and technology expertise. 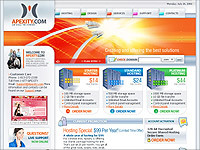 www.Apexity.com - Click the "Play Intro" on the home page. www.RKasset.com - Tampa city skyline with moving clouds. 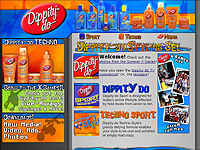 www.Dippity-do.com - Intro to support ESPN Summer X Games, and Dippity-Do Hair Gel. Flash Templates can be seen here. Need more information? Contact Support@Apexity.com or call (813)787-4127.